From the Liturgia Horarum [Liturgy of the Hours]. This is the standard form of the hymn as it is used liturgically. However, there is another verse to the hymn which falls between the second and third verses above. It is as follows: Mirantur ergo saecula,/ quod angelus fert semina,/ quod aure virgo concipit/ et corde credens parturit. 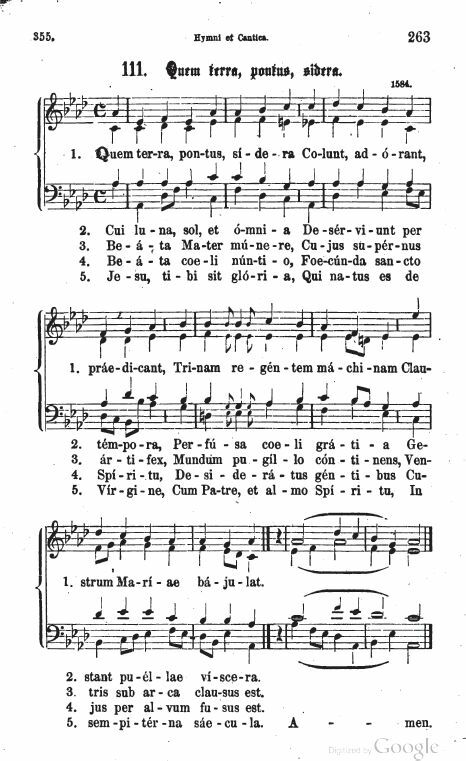 There is a second part of the hymn which is used as a hymn in its own right, O gloriosa domina. The translation is by J. M. Neale (1818-1866) except for the last two lines. His original lines were: "All glory, as is ever meet/ to Father and to Paraclete".